Coeur d’Alene, Idaho – November 29, 2018 – Timberline Resources Corporation (OTCQB: TLRS; TSX-V: TBR) (“Timberline” or the “Company”) today announced that it has filed NI 43-101 technical reports (the “Reports”) on SEDAR for the Company’s Elder Creek and Paiute Nevada copper-gold projects in the Battle Mountain district of Nevada (Figure 1). The Reports may be viewed at the Company’s website at http://timberlineresources.co/projects). The Reports, which were prepared by the Company’s independent geological consultant, Dr. Thomas Bidgood, provide a technical summary of each project. The Reports give an updated description of the two adjacent properties, including the regional geology, historic exploration, and work completed by Timberline since acquiring the projects from Americas Gold Exploration, Inc. on August 14, 2018 (see press release dated August 14, 2018 at http://timberlineresources.co/press-releases). The acquisition includes the right to earn into existing joint venture agreements with a subsidiary of McEwen Mining Inc. at the Elder Creek Project, and with Lac Minerals (USA) LLC, a wholly-owned subsidiary of Barrick Gold Corporation (“LAC”) at the Paiute Project. At Elder Creek, terms include the right to earn a 65% interest in the property through an existing joint venture agreement. At Paiute, an existing ownership interest of 75.4% was acquired by Timberline with the remainder owned by LAC (see press release dated May 24, 2018). With the closing of the transaction, Timberline is now the operator and manager of both the Elder Creek and Paiute joint ventures. The Elder Creek Project, which covers a claim group of approximately 39 square kilometers (km), demonstrates geologic, geochemical, and geophysical characteristics common to major porphyry copper-gold deposits (see press release dated June 18, 2018). 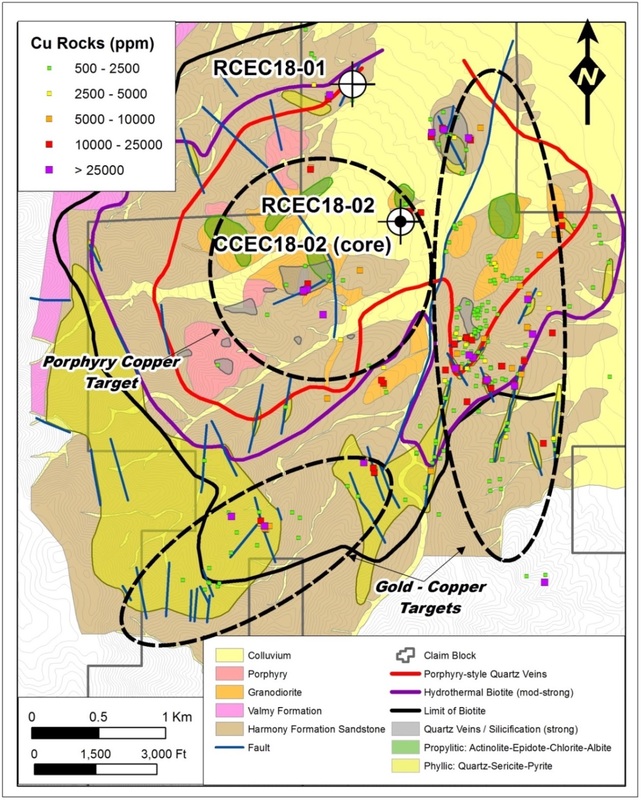 The core of the Elder Creek porphyry target covers approximately 4.5 sq km, and has multiple intrusive phases which form two granodiorite porphyry centers within altered Harmony Formation arkosic sandstone and shale (Figure 2). The intrusive rocks are similar in age to those at Newmont’s Phoenix gold-copper mine located 18 km (11 miles) to the south. The porphyry core of the system is characterized by intense quartz veining and elevated copper and molybdenum values in rock and soil samples, and is flanked by proximal potassic alteration and distal biotite-pyrite-pyrrhotite hornfels. It forms a pronounced magnetic low that is ringed by a strongly magnetic “donut” high of hornfels. Large areas of gold-copper veining occur within the hornfels to the south and east of the porphyry core, and copper oxide is exposed in outcrop immediately peripheral to the core. Since acquiring the project, the Company has completed three drill holes within the multi-stage hydrothermal system. The first hole, RCEC18-01, was drilled by reverse circulation (RC) at the Valmy pit copper oxide occurrence. It intersected hornfels after Harmony Formation shales and arkosic quartzite, and porphyritic intrusive rock, and contains 0.21% copper over its entire 500 foot (152 m) length, including 0.44% copper over 110 feet (34 m), and bottomed in strong mineralization (Table 1) (see press release dated September 27, 2018). Drilling at a second site located 3,250 feet (1 km) to the south (Figure 2) within the non-magnetic portion of the system was initiated as an RC hole and subsequently deepened by core drilling. Available assays from core hole CCEC18-02 show an intersection of 46.5 feet (14.2 meters) grading 1.20% copper, 0.31% molybdenum, 25.5 g/t silver, and 0.126 g/t gold within a broader zone of anomalous copper-molybdenum mineralization (Table 1). 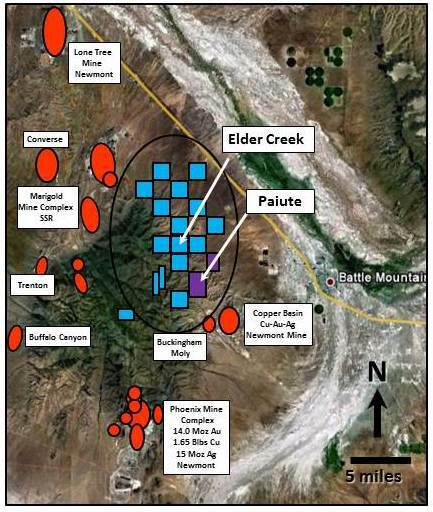 The Paiute project is 5 square km and is located immediately southeast and adjacent to Elder Creek, and approximately 5 km west-northwest of Newmont’s Copper Basin copper-gold porphyry deposit (Figure 1). It contains a copper-gold porphyry target and a gold structural zone target. The gold structural zone measures 2,500 meters long by 500 meters wide (Figure 3). It hosts gold-silver mineralization with multiple untested high-grade gold targets based on both recent and historic prospecting, and rock and soil geochemical sampling (see press release dated May 24, 2018. 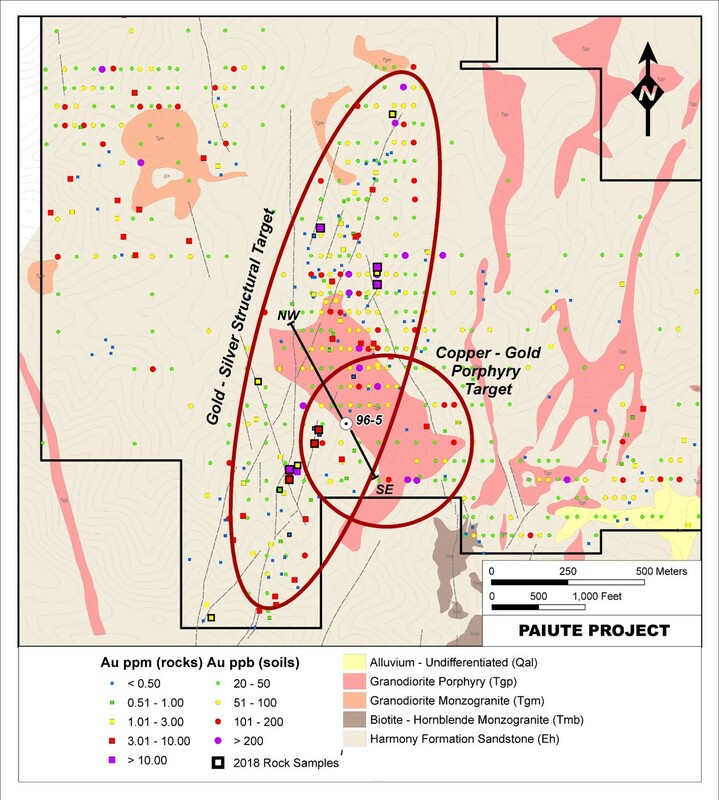 The property also contains a copper-gold porphyry target (Figure 3) with potential for discovery of mineralization similar to Newmont’s Copper Basin deposit. Multiple gold intercepts were drilled in 1995 -1996 within altered granodiorite porphyry. Vertical drill hole 96-5 intercepted quartz monzonite porphyry at 160 meters depth and was terminated at 178.3 meters due to technical difficulties after drilling 4.6 meters of copper sulfide (chalcopyrite) and gold mineralization grading1.24 g/t. Since acquisition, Timberline has completed additional surface rock sampling, and permitting with the Bureau of Land Management (BLM) for construction of drill roads and drilling. With the exploration success to date at Elder Creek, Timberline has contracted Zonge Geophysics of Reno, Nevada to complete a 10 km Induced Polarization (IP)/Resistivity survey at Elder Creek. The survey is designed to characterize the rocks for signatures associated with concentration of sulfides (IP), associated silicification (Resistivity) as hydrothermal alteration, and identification of major fault zones within the project area. The project is fully permitted with the BLM for additional drilling, which is planned after completion of the geophysical work. At Paiute, drill roads will be cut and outcrops mapped and sampled in preparation for an initial drilling campaign. Drilling will be designed to continue through the porphyry host rock to determine the depth extent of mineralization documented at the bottom of hole 96-5. Additional drilling will test near surface structural-related gold targets. Collection of drill core samples was completed under the supervision of a Company representative. Core was transported by the Company’s Qualified Person to Range Front Geologic in Elko, NV where it was cut and sampled by a Company representative. After preparation of the samples, blind certified standard reference materials and blanks were inserted into each sample batch which was transported to ALS in Nevada for analyses. Samples were assayed for gold by Fire Assay of a 30 gram (1 assay ton) charge with an AA finish (ALS code Au-AA23). Samples were also assayed for a 48 multi-element package using four acid ICP-MS (code ME-MS61). “Over-limits” were re-assayed using 4-acid Aqua regia digestion and ICP or AAS finish (code Cu-OG62). Steven Osterberg, Ph.D., P.G., Timberline’s President and Chief Executive Officer, is a Qualified Person as defined by National Instrument 43-101 and has reviewed and approved the technical contents of this release. Mr. Osterberg is not considered independent of the Company as defined in Section 1.5 of NI 43-101. Drill intercepts are reported as drill thicknesses; true widths of intercepts are unknown.